Asif Suria at Seeking Alpha has put together an overview of the App Store. The largest segment of the 160,000 apps, at 42%, are priced at just $0.99, while more than 24% are free. If you take a weighted average of the distribution, the most common price for an app is $2.41. To error on the conservative side and assume that more people are likely to buy a $0.99 app than a pricier one, Suria estimates the average price around $2.00. 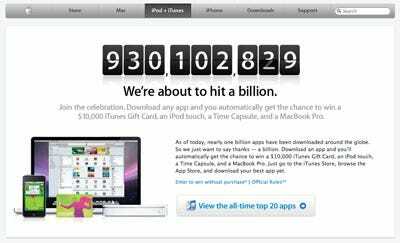 The App Store reached 3 billion downloads this January and he forecasts that number to reach 6 billion by the end of 2010. If you assume only 25% of users are choosing apps that cost something, Apple is estimated to generate $3 to $3.6 billion in revenue in 2010 from the App Store alone. And that means developers, which generate 70% of the revenue, have a market size of $2.1-$2.5 billion. That’s great news all around; Apple continues to be at the centre of the ecosystem and developers are allowed to feed off the platform. Speculation now is that Apple will store movies and all digital media in the cloud, which makes sense if this is already in the works for music. Doing so would also free up a ton of space on users’ hard drives and could encourage consumers to purchase more music and movies on the iTunes Store if capacity ceases to be an issue. For Apple, pushing music and movies to the cloud allows for bigger, more ambitious apps on storage-limited devices such as the iPhone, iPod, and iPad. There may be a snag, however: Hollywood. Studios may resist out of fear of losing control of their content. Pete Mortensen at Cult of Mac argues that without a doubt, iTunes has been the epicentre of Apple’s vision of creating a digital hub. What once was the Mac is now iTunes. And with the move to cloud computing, he fears that iTunes is becoming more and more like the consummate nightmare that Internet Explorer 6 was (is) for Microsoft. He even goes so far as to say the software’s shortcomings “could disrupt Apple’s current march to mobile device dominance.” iTunes has gone from music to being everything for every device; a scenario similar to Microsoft’s browser back in the day before Firefox. He poses the question: what should Apple do to avoid the same mess as IE6? It just got personal. John Gruber in his latest post about software patenting feels that Steve Job lashed back at HTC because he was insulted by the infraction, not necessarily that he’s worried about the actual product. The claim reads more like a letter you’d send a friend if you were peeved by something than like a lengthy legal document protecting the future of your company. “We think competition is healthy, but competitors should create their own original technology, not steal ours” said Jobs. Hopefully this is not a sign that Apple is going to flex its success and size to squash any competition that comes along. We’ve seen that story before and the last 10 years haven’t been easy for Microsoft.